Here at KartingTracks.com, we’ll help you find your nearest go karting tracks in the city of Leicester and the county of Leicestershire in just a few, easy steps. It’s easy to book a session at your preferred venue, and you’ll find an exciting line-up of outdoor and indoor racing venues to choose from. We’ve got everything from Arrive and Drive days for adults and children to the thrills and spills of a track session for hen party and stag party groups, as well as cadet karting courses and junior karting circuits for the under-18’s, and inspiring solutions for company team building activities. What kind of venues can you offer me? 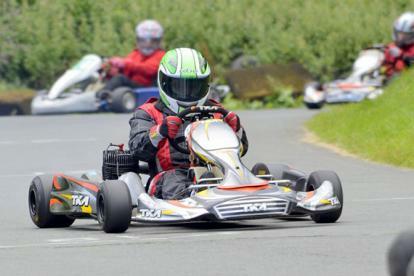 Stretton 2000 Leicester is one of the most popular outdoor go karting tracks in the Leicestershire area. It’s a fantastic venue to host your stag party or hen party, and you can also test your skills and stamina in sprint races, endurance events, and Grand Prix sessions, which could help to provide a bit of friendly competitiveness among colleagues and clients at team building days out and corporate karting events. Thanks to the 850 metre floodlit circuit, you can even enjoy occasions such as kids birthday parties or ‘Arrive and Drive’ after the sun’s gone down. F1K Indoor Karting East Midlands near Loughborough is a fantastic all-weather circuit that welcomes adults and children, as well as fundraising groups. There’ll be no tears and tantrums when you treat your child to one of the centre’s cadet karting classes or a junior karting experience, and if you’re desperately searching for exciting venues for kids birthday parties, F1K is an excellent idea. Also on offer are Arrive and Drive activities, where you can learn how to handle a go kart at your leisure or simply improve on the skills you’ve learned to-date in a non-competitive environment. Corporate clients are also well-catered for with a great choice of corporate karting events.